Would you like to know how to find your Envira Gallery ID #? This is located in the sidebar of your gallery and is easy to find. We’ll show you how to find the gallery ID number. Is this the same for albums? When you’re editing the an Envira gallery, you’ll see a sidebar on the right of the images called Envira Code. This sidebar contains relevant information to your gallery. 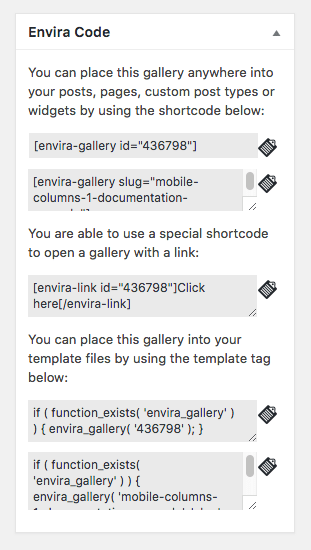 Things such as your gallery ID shortcode, the Envira Link and the php snippet you’ll need if you want to embed your gallery onto a php page template. When using CSS you may want to target a specific gallery for styling changes without it affecting every gallery. In these cases, you’ll need to prefix your CSS with the Envira gallery ID number. This is the number that appears inside your shortcode and there are many ways to find that number. 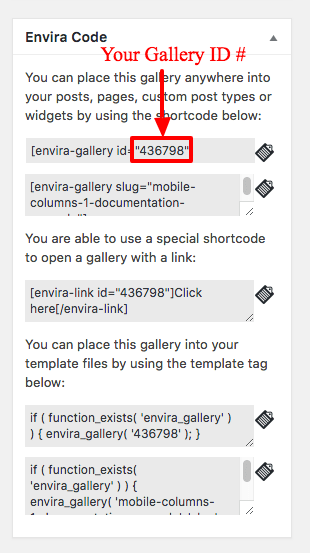 The easiest way being, while editing your gallery, to look for the number in the Envira Code sidebar. If you were attempting to prefix your CSS with the gallery ID, your CSS would look something like this shown below. Now that you know how to get the gallery ID number, why not check out some of our styling tutorials and experiment with some CSS styling for your Envira Gallery! A: Absolutely! When you edit your Envira Album, you’ll see the same sidebar with the ID number.